The following perspective on DSE 2017 was written by Craig Keefner, a manager at Olea Kiosks and the founder of the Kiosk Industry Group. I have been in the kiosk industry for 25 years, and over that quarter of a century I’ve attended more than my fair share of tradeshows and other events. Most of them were like KioskCom, focused on self-service. While Digital Signage Expo has been growing dramatically over the past several years, I had never made it to one of their expos until this one. My company, Olea Kiosks, was exhibiting. We brought our Milan kiosk in both portrait and landscape form, each equipped with brilliant Elo monitors. Also in our booth was Detroit, our newest QSR drive-thru kiosk. 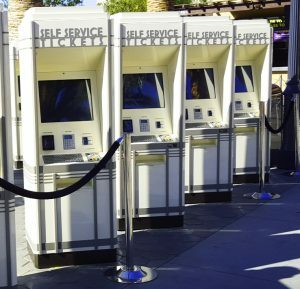 In addition, we showed a custom outdoor ticketing kiosk solution we developed and manufactured for a major Southern California amusement park. Owing to its dramatic art deco look, I refer to it as the Hollywood. The show historically has been focused almost solely on digital signage, but it has been transitioning recently to include “interactive digital signs.” This year, it formally introduced a large center section for transactional self-service. That’s what we/I do best. Finally, because I’m based in Colorado and Olea is in the Los Angeles area, it was a good opportunity to visit with folks from HQ, including Frank Olea, who hadn’t been to the show in a few years, as well as sales representatives Traci Martin and Scott Waldron. The floor was very crowded. I took videos (see below) and photos of several companies. They all agreed after the first day that the show was very worthwhile, with many opportunities to spend time with current and potential clients. The feeling held tight throughout the second day. Often at such shows, too many vendors and suppliers descend on the floor, distracting exhibitors by trying to sell to them, instead of letting exhibitors interact with their customers. Not so this year at DSE. I think it was just about the right balance, and all the vendors were well behaved for the most part. My guess is that everyone renewed and looked to expand or better locate their booths for 2018. I was struck by the response to the design of the Hollywood kiosk. Many people stopped to look and compliment its aesthetics. Part engineer, I was eager to show the equally remarkable internal workings, which also impressed them, but perhaps not with quite the same level of enthusiasm. Alas, even with kiosks, the looks of something rather than its substance often gets the bigger reaction. It was also nice to work with two of our partners. Our friends at Elo Touch Solutions hosted in its booth one of our Milan kiosks, all of which are equipped with Elo touchscreens. And wayfinding-software provider Mappedin allowed us to use their solution to demonstrate the Milan’s capabilities. I’m working with DSE and the Digital Signage Federation (DSF) to establish a kiosk council for DSF. It would provide guidance for self-service best practices, and Olea would be one of several kiosk companies happy to help lead that, if it can serve customers and the industry. It was a great show and we will back in 2018. Here are some videos from the show. Take a look! Olea has been manufacturing world-class products for customers across the globe for more than 40 years. The recent winner of three Most Innovative Kiosk Awards, our company excels at developing custom solutions that come in on task, on time and on budget. Reach out to info@olea.com or call us at 800-927-8063 for your free quote.